Discover the wonders of the universe. Packed with mind-blowing photography and full-colour illustrations, and using language that everyone can understand, All About Space brings the wonders of the universe to life in vivid detail, from near-Earth orbit to the infinite reaches of deep space. 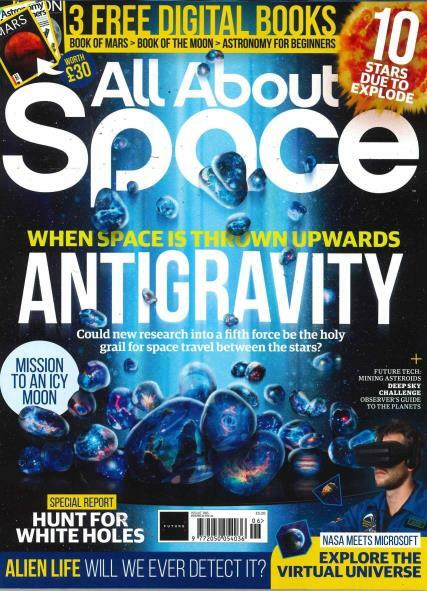 Buy a single copy or subscription to All About Space magazine. Every issue of All About Space takes you on an awe-inspiring journey through our Solar System and beyond, from the amazing technology and spacecraft that enables humanity to venture into orbit, to the complexities of space science. The magazine also features a regular Stargazing section, helping readers get starting in the absorbing world of amateur astronomy with how-to guides, kit reviews and advice. Nice magazine packed with interesting and informative stuff, my son loves it. This is a good magazine for anyone interested in space, astronomy, space exploration present and future. I fall into this category, and I buy the magazine regularly. It got off to a bit of a shaky start, in my opinion, but the ship has steadied, and it is now a good read. Very colourful! Interesting articles written by people who, mostly, seem to know their stuff. It is slightly less technical than the mainstream astronomy magazines such as Astronomy Now, Sky and Telescope etc, but is no worse for it. If you have a genuine interest in space, I can recommend it. I bought it as a gift and the person I got it for loves it.